Born in San Diego, but proud to call Murray, KY his home for the past eighteen years, Scott Thile is an American pipe artisan whose work exhibits a remarkable affinity for traditional shapes, both English and Danish neo-classical, as well as a superb craftsmanship that belies little more than half a decade of serious pipe making experience. Scott's first love was acoustic jazz and, from his teens, boasted some serious chops as a standing bass player (double bass), an instrument that he still plays as a professional today. For the past couple of decades, Thile has worked as piano tuner, as well as a much sought after repair craftsman for the same, and presently works at his local university keeping their grands and baby-grands concert ready. 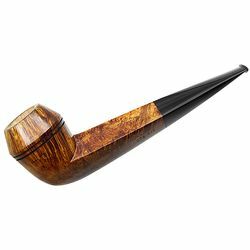 Scott's draft-holes are set to a smooth-drawing 5/32nds, and all of his bits are hand carved from German Ebonite or Cumberland. Though his training has been largely autodidactic, Thile has spent time with Todd Johnson and Bruce Weaver and cites Todd and Adam Davidson as influences. When asked what overarching aesthetic holds the most influence/fascination for his inner artist, Scott's answer was as interesting as it was succinct, "The Danish neo-classics as interpreted by the North American greats". Looking at Scott Thile's work, we'd say that he's right on target.